Downtown Frederick Partnership is thrilled to present the Alive @ Five summer happy hour series. Alive @ Five 2016 features 20 fun-packed events on beautiful Carroll Creek in Downtown Frederick, presented by CARE Veterinary Center. From May 12 through September 22, Alive @ Five will take place every Thursday. 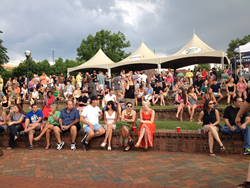 All happy hours are located at Carroll Creek Amphitheater between 5—8p.m. Beer, wine and food will be available for purchase. Alive @ Five is a 21 and older event and an ID is required for entry as well as a $5 cover fee. All proceeds benefit Downtown Frederick Partnership, Frederick’s designated Main Street organization dedicated to enhancing, promoting and preserving the vitality and economic viability of Downtown Frederick through implementation of the Main Street Program. Free Yoga, sponsored by Sol Yoga, will be offered at the Carroll Creek amphitheater from 7 a.m to 8 a.m every Thursday starting from May 12th to September 22nd. Sessions welcome all skill levels. Every other Thursday from 9—11am, enjoy Stitch by the Creek, a “drop-in” knitting session presented by the Knot House. Want to support Alive @ Five as a 2016 Friend of Alive @ Five? Visit downtownfrederick.org. In the case of inclement weather, the event will be cancelled. For more information, please contact Downtown Frederick Partnership at 301. 698.8118 or visit http://www.downtownfrederick.org.